The 2010 English DBA Open was held on 10th October at the Southsea Community Centre. Sponsored by Magister Militum and the Society of Ancients, thanks are due to Portsmouth and Allied Wargames Society for hosting the event. Congratulations to Scott Russell, the new English DBA Open Champion, and to James May, the new English DBA Open Junior Champion. The entrants played off in three pools of 6, the winners plus best runner up going into semi finals, the top four Juniors likewise into their own knockout phase. In semi final A, Scott Russell defeated Lindon Paxton (Early Carthaginians vs Syracusans) 4-2; In semi final B, Arnaud Marmier defeated Mark Schofield (Pyrrhic vs Camillan Roman) 4-0. Using the same forces, Scott Russell defeated Arnaud Marmier in the final 4-1. James May won the Junior event. Richard Pulley won the Plate Competition. Many thanks from the Society of Ancients to all those who supported the event. 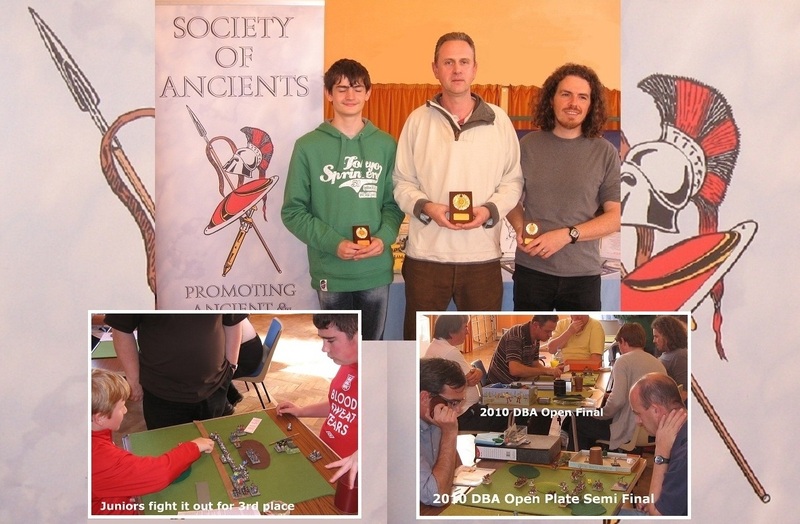 With a minimum of 5 games each, all the entrants had a busy and worthwhile day: we look forward to seeing everyone again in 2011 if not before. Pool results: A: A Marmier 22; M Smith 16; M Myers 11; R Dowling 7; D Constable 6; R Walker (J) 5. B: S Russell 21; M Schofield 20; R Pulley 8; T Ellis 6; S Etheridge 6; P Myers (J) 5. C: L Paxton 20; C O'Shea 14; P Steele 13; F Schofield (J) 11; J Drury 11; J May (J) 0. Armies and popularity: Viking (2); Ghaznavid (2); Early Burgundian (2); Patrician Roman (2 ... 1 East, 1 West) ... then 1 entry each: Early Sumerian; Minoan; Kushite Egyptian; Spring & Autumn Chinese; Asiatic Early Successor; Ptolemaic; Middle Imperial Roman; Feudal Spanish; Medieval French; Medieval Portuguese.